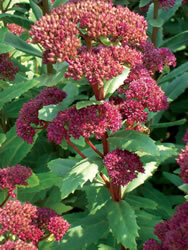 Sedum plants are hardy, drought tolerant and vibrant flowers. These bright little plants are very versatile and perfect in rock gardens, flower beds, hanging baskets, roof gardens and as groundcovers. These easy to care for flowers can also be uses as a house plant! The Emperor's Wave Sedum is a beautiful flowering plant that produces dense, purple-red umbels that are held on dark-stems.